Samsung and LG have announced new flagship phones at this year's Mobile World Congress, and this time around you can plug a microSD card into either one. That makes now a pretty decent time for SanDisk to announce a new microSD UHS-II card with transfer speeds of up to 275MB/s (also, a dedicated USB Type C flash drive). SanDisk's Extreme PRO microSD offers roughly three times the read speed of the company's current Extreme UHS-I microSD card, which can transfer data at 90MB/s. The new write speeds top off at 100MB/s. With this leap forward, SanDisk's tiny cards are now comparable to its full-sized Extreme PRO SD cards that can reach read speeds of 280MB/s. The Extreme part of the name comes from this line being marketed as shockproof, temperature-proof, waterproof, and X-ray-proof. These new class 10 cards come in two sizes, 64GB and 128GB. SanDisk probably figures that if you're trying to move around data this fast, you're moving large files that would fill up 16GB or 32GB too quickly to be worth it. 64GB and 128GB both give you plenty of space for photos and enough room to record a decently long video or two.The smaller option goes for $179.99, while the other is $299.99. BARCELONA, Spain--(BUSINESS WIRE)--MOBILE WORLD CONGRESS -– SanDisk Corporation (NASDAQ: SNDK), a global leader in flash storage solutions, today introduced the world’s fastest microSD™ card. 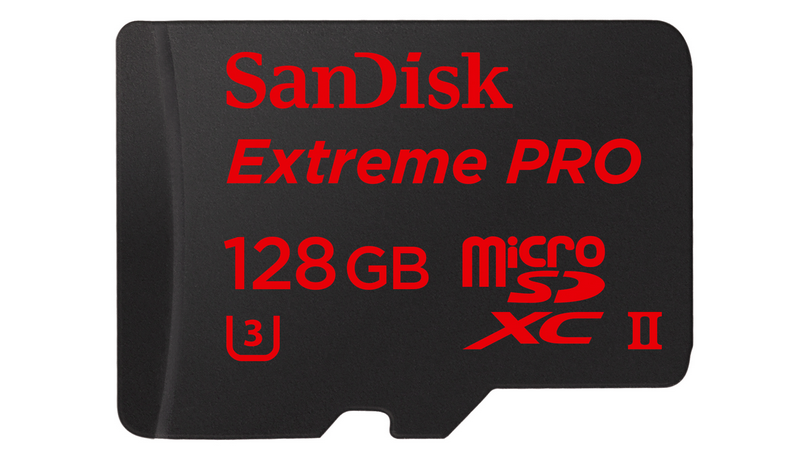 The SanDisk Extreme PRO microSDXC UHS-II card enables action camera, drone and smartphone users to offload huge video files at unprecedented speeds. The new card, available in 64GB* and 128GB capacities, delivers transfer speeds of up to 275MB/s to offload high-quality content at record speeds. Featuring Class 10 and UHS Speed Class 3 (U3), the SanDisk Extreme PRO microSDXC UHS-II card is perfect for capturing Full HD and 4K Ultra HD video on the latest action cams, drones and smartphones. It also includes a USB 3.0 card reader to conveniently offload files to a PC. The latest action cameras, drones and smartphones are versatile, powerful devices that have expanded the possibilities for high-quality video. SanDisk Extreme PRO microSDXC UHS-II cards are backwards-compatible with UHS-I host devices, performing up to UHS-I speeds allowed by the host device. Also designed for today’s durable devices, the cards can keep up in extreme environments. SanDisk Extreme PRO microSDXC UHS-II microSD cards are shockproof, temperature-proof, waterproof, and X-ray-proof. The 64GB and 128GB SanDisk Extreme PRO microSDXC UHS-II cards feature a lifetime limited warranty, and will be available worldwide in Q2 at U.S. MSRPs of $179.99 and $299.99, respectively.